Met up with Mom yesterday at the Cumberland Mall and decided that we needed more time to hang out with each other. So we did what we do best: we went to the movies. Apparently 2:00 PM is a very unpopular time to be screening films because the only things available were Breaking Dawn (couldn't bring ourselves to do it) and Tower Heist. Now I wasn't too thrilled at first to be watching Tower Heist. THe movie was highly anticipated but after Thanksgiving I don't really recall hearing anything at all about it, and seeing Eddie Murphy made me a little skeptical (let's face it, after the disasters of Pluto Nash, Norbit, Imagine That, and Meet Dave, there has been little to redeem this poor man). But Tower Heist actually ended up being a pretty bearable movie, thanks to an awesome supporting cast and a plot that would interest people that have been perhaps screwed over by the recession (99%? Anyone?). 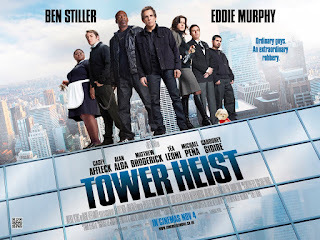 The plot revolves around Ben Stiller's character, Josh (he doesn't look like a Josh to me, but I digress..), who is the expert concierge of a high class apartment complex called The Tower. The man who owns The Tower, Arthur Shaw (played menacingly by Allan Alda), is pretty tight with Josh in the beginning and one gets the vibe that Josh kind of looks up to him as a father-type figure. But trouble strikes when we learn that Shaw is being investigated for fraud and that Josh invested all the staff's paychecks in his stock (or something...finanace isn't my thing. But basically all you have to know is that Josh screwed up by trusting this guy and everybody loses money cuz of him). SO! Josh, feeling extremely guilty that these people don't have money because of him, decides to get back at Shaw and hence plans a Tower Heist (see what I did there?). I'm pretty sure this is how they did it in Ocean's 11.. This film was actually kind of unexpectedly charming. The major plotters of the heist are adorably inexperienced. Matthew Broderick plays the hilariously bankrupt Wall Street banker, Mr. Fitzhugh, and I'd be lying if I said he wasn't my favorite character in the entire film. 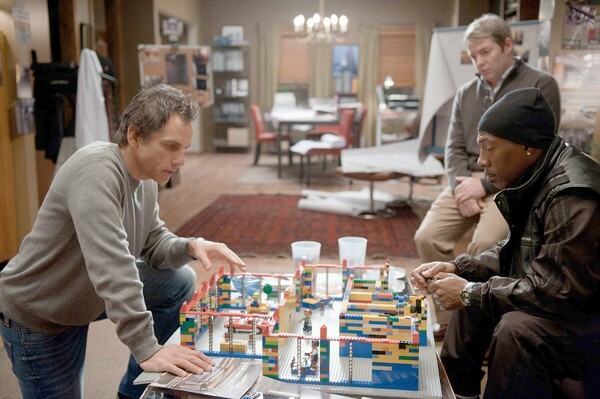 Additionally, Eddie Murphy, Casey Affleck, and Michael Pena made up an unbeatable team to match (and even overshadow) Stiller's charming underdog character. In an interesting twist, the movie doesn't get caught up in gadgets and impeccable timing like other espionage movies. The film is obviously unrealistic, but is honest in that it never pretends that these guys are anything but working class heroes. Even Fitzhugh, who was an investment banker (or something else high up) is equal to the others in that he now has nothing. This film sort of realizes the problems of the recession, the issues with the wealthy, and the endless loop of unrecognized hard work and battles it with the camaraderie, love, and humor of the lower middle class. I'm mildly surprised that this movie didn't do better actually. The ending isn't 100% happy, but if puts the working class in the position of martyr for the greater good, making honor more important than happiness (which is maybe hinting at an attitude that we should try). 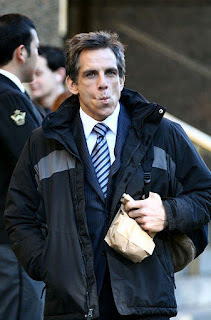 The only thing that bugged me about this film's sort of social agenda is the fact that these actors are top-grossing comedians who aren't technically in the 99%, so the material was therefore a little hard to swallow since you're kind of watching it and thinking "well, no offense, Ben Stiller, but I'm not buyin' it". So maybe I just answered my own question, haha, but check it out for yourself. Your sack lunch does not fool us, Ben Stiller.